The following article was originally posted on July 16, 2018 via Iowa State University News Service. AMES, Iowa – Many Iowa State University graduate students follow the path toward academia, but a number of students pursue careers in business and industry. That is why Iowa State’s CyBIZ Lab and Graduate College are expanding opportunities for graduate students to work on short-term projects with businesses and nonprofit organizations. 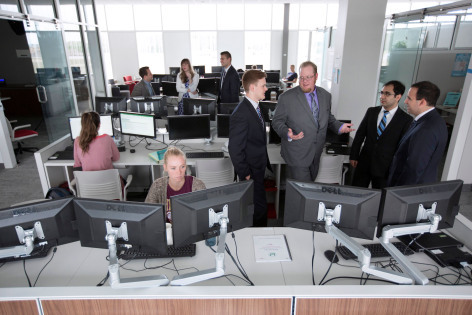 ISU’s Ivy College of Business launched the lab in 2013 to give undergraduate and MBA students experience working on consulting projects, market analyses and feasibility studies. The Burroughs Wellcome Fund awarded Iowa State a $50,000 grant to develop and pilot a model to hire graduate students across disciplines. Judi Eyles, Pappajohn Center for Entrepreneurship director, says CyBIZ Lab is one of the first to create interdisciplinary teams of undergraduate and graduate students, which is beneficial for all involved. To date, CyBIZ Lab has completed more than 150 projects for organizations in Iowa and across the Midwest. Once the graduate pilot test is complete, CyBIZ Lab will share the results so that other colleges and universities can adapt the model for their programs. CyBIZ Lab will coordinate with Iowa State’s Graduate College and academic college partners to identify industry partners for the pilot project. The grant will cover the $7,500 project fee, but once the graduate model is established, clients will be responsible for the cost of future projects, Eyles said. Graduate students will manage the project and lead a team of undergraduates to meet client deadlines and expectations. Karin Lawton-Dunn, Graduate College career services coordinator, says many of the students she assists have spent years in higher education and have little work experience outside a lab or academic setting. Working with CyBIZ Lab will help them identify career options, build a portfolio and increase their professional network. The experience of working to solve real business problems is invaluable for students, but organizations also see a return on the investment. The Des Moines Area Metropolitan Planning Organization received the 2018 Prometheus Award for “Best User of Technology” for its Container Locator website. CyBIZ Lab conducted extensive market research and then built the website, which allows Iowa-based shippers to lower costs by utilizing shipping containers that otherwise leave the state empty after a delivery. The Association of Public and Land-Grant Universities also recognized the CyBIZ team of graduate and undergraduate students for its work on the website. The CyBIZ Lab project was one of the featured cases that resulted in ISU receiving APLU’s Innovation & Economic Prosperity Talent Award. One of the graduate students on the team incorporated the project into his master’s thesis.